If you don’t get plenty of whole grains in your diet, you should. Whole grains are packed full of nutrients and complex carbohydrates that decrease insulin levels while providing sustained energy. They’re also loaded with fiber, which improves bowel health, helps regulate cholesterol levels, helps you lose weight, and helps regulate blood sugar levels. Considering the health benefits associated with whole grains, it’s unsurprising that new research shows that eating them could help you live longer. Specifically, researchers found that people who ate 3 or more servings of whole grains daily (about 70 grams) had a 20% reduced risk of premature death during the study period, compared to those who ate fewer or no servings of whole grains. For each additional serving of whole grains, the risk of cardiovascular disease-related death dropped by 9%, and cancer-related death risk dropped by 5%. The findings come from scientists at the Harvard T. H. Chan School of Public Health, who analyzed 14 published studies of long-term health information from 786,076 participants. plus additional pertinent data from the National Health and Nutrition Examination Surveys (NHANES). Of the 786,076 subjects, 97,867 died during the studies. Nearly 24,000 died of cardiovascular disease and over 37,000 died of cancer. This is the first large analysis of whole grain consumption and premature death. 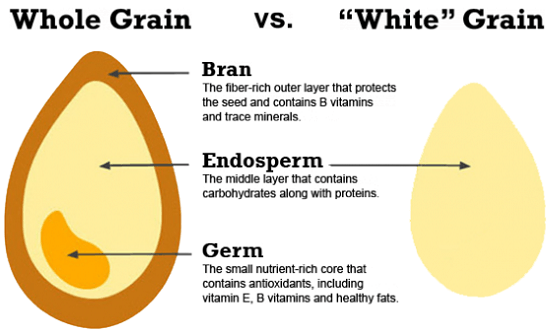 Whole-grain nutrients are released in the digestive tract more slowly than those in refined grains, such as white flour, white rice, and regular white pasta. Also, people tend to chew whole grains longer, which stimulates more satiety hormones. Sun added that although whole grains are readily available in store, most people don’t consume enough of them. He also said that low-carbohydrate diets that neglect the health benefits of whole grains “should be adopted with caution,” due to a higher risk of heart disease.